LG X Mach is an Android phone that is designed to for speed at an affordable price. Those two things usually don't go together. Its thicker size, however, is what we expect from a mid-range phone. The LG X Mach is out to fix the last thing people think of when they buy a new phone, but the first thing they often complain about: network speed. Like its name suggests, this Android 6.0 Marshmallow phone is far faster than any other in its category. That's because it boasts the new LTE-Advanced standard, LTE Cat. 9 3CA. You can find that on newer devices, like the Samsung Galaxy S7, S7 Edge and a few other handsets on our best phones list, but they all come at a premium price. LG X Mach is set to be cheaper and it's also outfitted with competitive specs and a camera that does performs well in low light conditions thanks to the fact that it captures larger pixels. It's an Android challenger that came out of nowhere at sound-barrier-breaking speed. There's no final LG X Mach release date or price, but the company says it's coming to South Korea later this month. Here's what I found when testing this new LG X Series phone out in Seoul, Korea. The name X Mach makes this LG phone sound like it's a jet fighter pilot's futuristic smartphone that is so svelte it doesn't have any problem breaking the speed of sound too. That's... not really the case. Its look and feel is pretty straightforward with a minimalist front face (no buttons anywhere) and a fairly boxy look. Overall it's actually a little chunky. Its dimensions are 149.1 x 76.5 x 8.9mm and weighs 150g. Don't worry, it's what's on the inside that counts for the LG X Mach, and it puts on a very good quad HD smile, anyway. It has a 5.5-inch Quad HD Quantum IPS resolution that looks better than the LG X Power's 5.3-inch screen. I could see the difference with my naked eye - the X Mach was brighter and sharper. Like the front, the sides are devoid of buttons, reserving them for the back of the phone. The LG G5 may have changed the flagship design, but the X March rocks the classic rear volume rocker, miss it or not. This also gives the phone a chance to incorporate a fingerprint sensor, which is becoming more meaningful with Android Pay becoming more widely implemented throughout the world. The LG X Mach wants to be the higher-end mid-range of the X Series, and it starts that off with a 1.8GHz hexa-core processor, 3GB of RAM and 32GB of internal storage. Not bad for a mid-range. It's definitely not going to outperform the LG G5, Samsung Galaxy S7 Edge or Samsung Galaxy S7. You're also not going to pay nearly as much for chip performance you may not ever really use. Everyone, even casual Android owners, use their phone's camera. So it's good news that the LG X Mach didn't skimp on the 12.3MP sensor. It captures larger 1.55μm pixels for better low-light photos. The newly revealed LG X Power has a whopping 4,100mAh battery and it's the one place where the LG X Mach falls short. But it's not too short with a healthy 3,000mAh battery. That should be solid enough. There's a lot going on with the LG X Mach, and that's the reason it's a little bigger than your average mid-range phone. First and foremost, it carries LTE Cat. 9 3CA for faster speeds. It was only with the Samsung Galaxy Note 5 and Galaxy S6+ that we began to see this form of LTE-Advanced rollout to smartphones. It's now in a budget handset with the debut of the LG X Mach. There's still a lot of testing to be done. The specs need to be benchmarked to see if they're speedy too and that promising 12.3MP camera needs to be put through its paces. Same goes for the battery life with its very reasonable 3,000mAh. 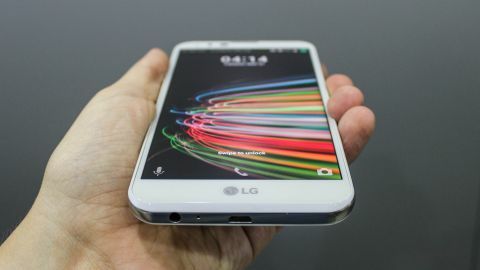 The LG X Series basically takes a big feature from other LG phones and fits it inside a more budget-friendly handset. This one is all about speed. Here's to hoping it launches quickly outside of Korea.